HOW DO YOU FED-EX THE POPE? If you woke up on July 7, 2005 to a strange grinding noise, you may have been in the proximity of one of those scientists who were gnashing their teeth over breakfast that morning while reading the New York Times OpEd page essay "Finding Design in Nature" by Christoph Schönborn, the Roman Catholic cardinal archbishop of Vienna, and a close colleague of the current Pope. The loudest sounds probably came from a Cleveland suburb where Lawrence Krauss was reading the Cardinal's endorsement of "Intelligent Design" as an alternative theory to the fact of evolution. Krauss, a physicist/cosmologist, at Case Western is an activist with regard to promoting science and rational thought in American schools. He is willing and able to go into the belly of the beast and lecture at conservative and religious colleges and universities where he the presents the case for science. Usually, he says, the response is on of appreciation. He is the right scientist to take on the task of communicating on an important scientific matter with the Pope as his words and his tone will be such that the letter may have a positive effect. In the case of Christoph Schönborn's OpEd piece, Krauss decided that something had to be done. He wrote a letter to Pope Benedict with two coauthors, the eminent biologists Francisco Ayala and Kenneth Miller, both devout catholics. "I knew The Times was planning to write a story on the letter," Krauss says, "so I knew I had to get it to the Pope before the Times ran the story. I discovered that the Pope had an email address, so that was very helpful. Most of the difficulty in trying to write the hard copy letter was trying to figure out how to address the Pope, both literally and metaphorically — what do I call him? And where do I send the Fed-Ex?" "I found what I thought was the right address, and the right salutation, and I got it off in a Fed-Ex box but I realized I forgot to put the attachment in the Fed-Ex box. I went back to the box and waited for the Fed-Ex driver — and had it all made up, new attachments and everything, ready for him, and said, "please let me just put these things in. This is important; it's going to be in the Times tomorrow, it's going to the Pope and it's about evolution". I quickly found out the Fed-Ex driver was a creationist. We had a long discussion. At the conclusion, I said, "please send it". He replied: "Of course I'll send it. Believe me, I take my job seriously." 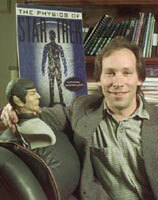 LAWRENCE M. KRAUSS, professor of physics and astronomy at Case Western Reserve University and chair of the Physics Section of the American Association for the Advancement of Science, is on the steering committee of ScienceDebate2008. His most recent book is Hiding in the Mirror. My letter to the Pope was actually the second round. The first piece I wrote caused my wife to say I totally sold out. That piece was for the Times, arguing that science and religion were compatible. I used an example which I is one of the best examples of the relationship between science and religion. It involved Georges-Henri Lemaître, who was a Belgian priest, who was also a cosmologist, a physicist. He was the first to recognize that Einstein's equation had a solution that implied a big bang, which was the beginning of the universe — that really flew in the face of science at the time. Einstein didn't believe it. He came around eventually, but early on he was very vicious in his criticism of Lemaître, and this viciousness with regard to people who disagreed with him was a trait from his youthful days that few people know about. Lemaître had discovered that you could have a beginning of the universe, and a big bang, and what happened at the time was that Pope Pius picked up on that and wrote this grand letter saying science has finally proven Genesis. And Lemaître wrote the Pope and said, 'Stop saying that': this is a scientific theory, it makes predictions — take from it whatever metaphysical or religious implications you want —take from it that it vindicates the story in Genesis — take from it that there is no God, that you don't need it, that the world works without it — interpret it however you want. But the science, the predictions, are independent of your interpretation of the results! I thought that was a less-charged example, but still incredibly apt for evolution. Evolutionary biology exists, it happened, and it describes the universe. Whether you take it to mean, as Richard Dawkins might, that there is no God, or, as two religious biologists that I got to sign on my letter to Pope Benedict — that there is a God — it's up to you. It was an innocuous piece. Nothing much happened from that, I didn't get any hate mail, and the piece disappeared. Then an OpEd piece appeared from Cardinal Schönborn in the New York Times, and I told my wife that I thought it was a response to my piece. And she said to me, "The world doesn't revolve around you". And I said, "you're right, it's crazy". The next day the Times called and told me that the Cardinal's piece was written in response to your piece, and we're doing a story. I decided, okay, I really need to act here. It's not that I care about what the Catholic Church does, except that I worried that it was like the Lord of the Rings. I didn't want the 'forces of darkness' in some sense to converge. We have these misguided evangelicals in the United States arguing against evolution, and I felt that by showing that the Catholic Church wasn't opposed to evolution, I could point out something very important, which was that you don't have to be an atheist to believe in science. And I do think that's important. I've debated it with Richard Dawkins, in fact. It was important that misguided but influential evangelicals and misguided but influential Catholics not converge together, because if the Catholic Church appeared to be on side of the evangelicals, it would be a disaster in term of the efforts of those of us who are trying to convince people that science is worth learning. I studied the Catholic theology, and the International Theological Commission, and wrote the letter. Francisco Ayala, a prominent biologist, who had previously been a priest, signed onto it, along with Ken Miller. a well-known biologist who's also a devout Catholic and who was a key witness against Intelligent Design in the Dover trial. Then I sent it the letter to the Pope. Or, better said, I tried to send the letter. But, how do you Fed-Ex the Pope? The Times was planning to write a story on the letter so I knew I had to get it to the Pope before the Times ran the story. I discovered that the Pope had an email address, so that was very helpful. Most of the difficulty in trying to write the hard copy letter was trying to figure out how to address the Pope, both literally and metaphorically — what do I call him? And where do I send the Fed-Ex? I found what I thought was the right address, and the right salutation, and I got it off in a Fed-Ex box but I realized I forgot to put the attachment in the Fed-Ex box. I went back to the box and waited for the Fed-Ex driver — and had it all made up, new attachments and everything, ready for him, and said, "please let me just put these things in. This is important; it's going to be in the Times tomorrow, it's going to the Pope and it's about evolution". I quickly found out the Fed-Ex driver was a creationist. We had a long discussion. At the conclusion, I said, "please send it". He replied: "Of course I'll send it. Believe me, I take my job seriously." The Fed-Ex package is on it's way. Five days later I get a call from Fed-Ex in Italy, saying, we have a Fed-Ex envelope here for Pope Benedict in the Vatican; we can't find this person. I said, "do you mind if I buy futures in Fed-Ex and then announce that you can't find the Pope in the Vatican?" They thought that was amusing. Two days later Fed-Ex calls saying, we need a street address. I had a street address, of his palace, and gave it to them. Two more days go by and I get a call: "we need a phone number". Amazing. Then they told me that the Pope's office had refused the letter. At the same time, I had been working through colleagues and friends in the Pontifical Academy in the Vatican, to figure out how to formally do this, and, through this channel, I had also sent the letter to the Prefect of the Congregation of the Doctrine of the Faith. That organization, which Benedict had run, has an illustrious history and a better known name: The Inquisition. And that is the official way to reach the Pope. That Fed-Ex letter went through no problem. They wouldn't accept the Fed-Ex package at the Pope's office because there's probably a policy for the Pope's office, that they won't accept packages sent directly to the Pope; that they have to go through the proper channels. I know it arrived before the Times wrote the story about it. I've been in the Vatican, and it's an interesting place. I was at a meeting at the Pontifical Academy, and I was leaving late at night, and I got locked into the Vatican. The Vatican guard said you have to go underneath the cathedral to get out — there's a tunnel under there. So they take me to this tunnel, and right underneath the cathedral is an ATM machine. I wanted to stop and see if you had to put a card in or not. In any event, I did have an important reason for writing to the Pope. I felt that it was very important that he validate what the Catholic Church had said under John Paul, which was that they had no problem with evolution. In fact they call it contingent phenomena, by which they mean random mutation, and it's okay with a belief in God. They see God as the 'cause of all causes', as John Paul put it, and therefore God can choose to work through natural selection, and even 'random mutation', or as they put it, contingent phenomena. That's the point that I tried to explain to Richard Dawkins, when we were up in Buffalo together at a meeting. Dawkins and I hate to put words in his mouth, but we discussed this) gave a talk in which he said something to the effect that religion is bad science. That's a disastrous thing to say. I totally disagree with it, because it exactly plays into the hands of those people who want to suggest that religion is somehow scientific. He's argued that if people say that life is highly improbable, then God is even more improbable. But that misses the point that God is beyond the bounds of physical law, and you can't use physical law to describe God. That may be, if you're Dawkins, one of the reasons why religion appears so silly, but nevertheless it obviates the whole effort to scientifically estimate probabilities associated with God. So I wrote the Pope, and I didn't expect the him to write me back. I thought he might write the two Catholic biologists. But more importantly I wanted to provide him the motivation, and the Catholic Church the motivation, to make some public statements. But, I don't know if my request to the Prefect that they burn Cardinal Shoenburn at the stake had any impact. A key question that we all had is the relationship between Schönburn and the Pope. Schönburn was closely allied to Benedict. And he has gotten more conservative as the Pope rose to prominence in the Church. Was he getting any prodding to do this? This was worrisome, because previous to that the Pope had made statements that were of concern. He made a statement that the church's actions against Galileo at the time were correct. We were concerned, and I wanted to see if the Pope had changed his views. When he was head of the International Theological Commission, that organization had come out with the statements backing evolution, so it seemed like he was on the right side in that regard. But in the end, the good news is that Schönborn has since recanted. The papal newspaper has produced several articles saying that evolution is compatible with the Catholic theology. It's interesting that Schoenborn's piece was published by The New York Times, which is arguably one of the best newspapers in the country, and most scientists agree it's science reporting both in the daily paper and in "Science Times" is first rate, yet incorrect or silly anti-science too often makes its way onto the other sections of the paper. This all comes down to the failure of our educational system to provide students with a well-rounded education. I spend a lot of my time when I'm not doing science, talking to people about science, and trying to get them to understand it and be interested in it. One big problem is that most middle school science teachers don't have any science background. Equally serious is the fact that the people that we label as cultural role models, as intellectuals, are proud to proclaim their scientific illiteracy. This is equally important — because you've got all these bright young kids who are looking at role models, and the role models often aren't scientists — are in fact often anti-scientists. And I think that is a huge problem. For someone like me — what I spend a lot of my time trying to do is bridge — as do you, I know — is to bridge the gap between science and popular culture. Teaching is selling. Writing is selling. The biggest mistake you make is to assume people are interested in what you have to say. When you assume that, immediately you've lost. What you have to do is reach people where they are. And I believe that is the case with writing as well. As a working scientist I try and balance my time, and I often wonder if something is worth my time, but I do think that the work I do trying to explain science, or get people excited about science — and also fight off attacks on science, which unfortunately is a greater percentage of my time now than it's ever been before — is perhaps one of the more useful aspects of my time. I do it because someone has to do it. But again, the sad part of it is, I used to spend my time trying to get people interested in science; now in the last 6 or 7 years or decade it's spending more time trying to fight off overt attacks coming from Washington, or from the church, or from misperceptions of religion and science. And it is very frustrating, because we do such a bad job. The National Academy of Science just produced a document, "The Gathering Storm", and we really desperately need to do a better job. A couple of decades about I could not have predicted we would be in this situation. By the same token, I have certainly evolved in my thinking, or certainly in my actions — I believe that it's vitally important, and this is where I disagree with Dawkins as well — and maybe Dennett a little bit — it is vitally important not to needlessly offend certain religious sensibilities in one's writing. There's nonsense theology, and that you should offend. You should offend those people who say the earth is 10,000 years old, because it's not. It's just not. There's no debate, You don't have to try — there's no compromise when it comes to scientific facts like that. But if we are trying to convince people that science is useful and interesting, we defeat the whole purpose if the very first thing we do is attack their personal beliefs. And if you say, 'you're stupid, now listen to me'. That just doesn't work. You have to recognize that a lot of people, and in fact in this country most people, have for one reason or another, spiritual beliefs. And since I have come to recognize that it is of profound importance that science doesn't often really address questions of purpose and design — I mean ultimately it can — as I often say, if tomorrow night when I look up in the sky I saw the stars suddenly rearranged saying 'I am here', hey, I'd buy design. That's I think a clear example of an empirical test that would suggest that there's design. But short of those things, if science doesn't find evidence for design — and it certainly hasn't, that's overwhelmingly clear; there's no evidence for design in spite of all this nonsense that is promulgated—but the lack of evidence for design doesn't mean that the world wasn't designed, or that there's no purpose in the universe. Whether you believe that, again, just like LeMaitre, is a philosophical. I tend to see no evidence for design and see no reason that the universe is designed, but that's a personal view. But I do worry about scientists who take this one step further and say, because there's no evidence for design there was no design, because that is a non-scientific statement. And the minute you're making it, you're getting on the same ground, the same water, as the intelligent design advocates — who are trying to misrepresent science. So we have to be very careful about the fact that science has limits. And as a physicist you have to be more careful. Because the physicists are the most obnoxious and pompous of all the scientists. Why? Because we're the best, of course. Physicists — especially particle physicists — are dealing with the fundamental stuff — and I grew up in that culture. But we really have to work hard to try not to convey the notion, as we do, often, that science is everything, and if you're not doing science, you're not doing anything useful. Because I think it's self-defeating to do that. There is a natural tendency for scientists to behave this way. I have evolved in my speaking and my writing, from being somewhat controversial on one side, or really provocative, in terms of trying perhaps to put down people, to realizing that to effectively convey information one has to reach people again where they are. If they're coming from a deeply spiritual background, you have to reach and try and understand where they're coming from. You can write something cute and intelligent and witty, but if you actually want to reach them and convey information you have to recognize where they're coming from. But you have to go after some people. Today I will use a quote from Bush in a speech I'm going to give later this morning in Staten Island. If you look at what Bush said, he didn't endorse intelligent design; what he said was, 'I think both sides of the debate should be taught'. Now a priori, unlike most things Bush says, that's not stupid. It would be a correct statement, if indeed there were both sides of the debate. What it represents is a profound misunderstanding of the science that there are two sides. And so what we have to go after them for is not the stupid statement they make, but rather they don't understand the science. What we have to do with those kinds of people is educate them. But Frist knew better and should be attacked. There are others who should be attacked, and I've thought about writing a piece about this. I made the mistake of going on Hannity and Colmes after Bush made his statement, because of my piece in Times or whatever, I became a poster child for getting on these evening programs. I agreed to go on against the one of the heads of the Southern Baptist Convention, and — I didn't know much about him, I just went on. And you know the way they work, if he didn't interrupt me when I was trying to make a point, they would. But I came away from this saying that we should respect people of faith who are honest about the faith, and who try and accommodate, obviously, what we know about the world. But people like this guy at the Southern Baptist Convention — we should go out and attack them, I think, and say to people of faith, 'if you believe in God, you should choose a sect, or a religious group, that doesn't lie!". You should leave the Southern Baptist Convention and join a group whose officials don't lie about and distort science. And I thought, maybe we should attack them in the same way that they're attacking scientists. What really upset me and really offends me about these people is that they would rather children be ignorant than be exposed to knowledge that might — quote unquote might — weaken their faith. And that attitude of course is the same with the Taliban. I do believe the greatest threat to our freedom, in a democracy or not in a democracy, is sort of the censorship that controls information. And knowledge, one way or another, breeds freedom. And so for me, to actively promote ignorance is the worst thing you can do.